Youngest son cleared out his closet before leaving for college, and put a lightly worn pair of Hollister jeans in the thrift store pile. I like dark denim and need some more pants (I prefer skirts, but need pants for walking to work). Now, youngest son and I may share the same genes, but I could not wear his jeans without some major “up-sizing”! By the way, today’s refashion is brought to you by the album Well, Well, Well by Milburn. I actually listened to it twice all the way through because I got involved in the project and forgot to change music. I just decided to kind-of-randomly chop away/add in some contrast fabric/do a lot of pinning and trying on/cross my fingers………..in other words, wing it. I used a really muted tartan from Cali Fabrics as my contrast. Unsurprisingly, I ended up doing a bit of patching together, due to my complete lack of planning, so had to add some pockets to cover unwanted seams. Luckily, I had cut quite a bit off the leg length, so had some scraps to work with. Well, now I can get them on, AND do up the buttons (grrr…darn button fly, prefer zips). Not bad for a Sunday afternoon’s work and a little fabric from the stash – thanks, son! The February pattern for sewmystyle is the Saunio Cardigan from Named Clothing. I decided to make this a combo Sew-from-Scratch/Refashion-Project. First things first – I put on Get Cape, Wear Cape, Fly . I had heard a couple of songs on Lastfm, but only just got round to buying Searching for the Hows and Whys. A good purchase! I only had enough of this rib for the back and front pieces, which is where the refashion part of the project comes in. I had picked up this big sweatshirt at Goodwill a couple of months ago – I liked the frayed hems, and I know I’ll always use T-shirts or sweatshirts for something because they’re somewhat forgiving on size and quick to sew. I wanted to cut off and open up the shirt sleeves and keep the original frayed hem cuffs. 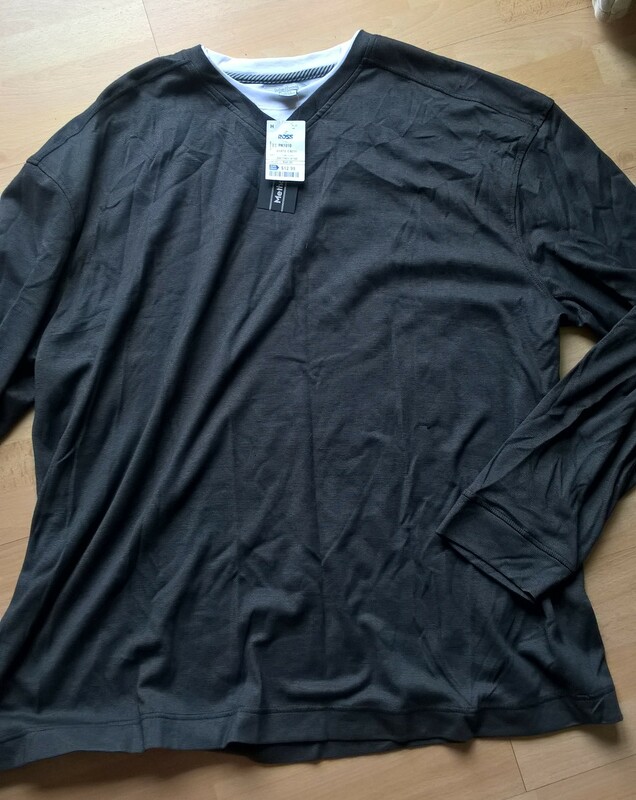 Uh-oh ….PROBLEM: the sweatshirt armholes aren’t as deep as on the Saunio pattern. Therefore the sweatshirt sleeve isn’t wide enough. Oh well….SOLUTION: I figure nobody’s going to be doing underarm inspections on me (that would just be weird?? ), so I pieced the sleeves together, overlocking scraps of fabric on either side. I just managed to get the facings out of the body of the shirt. The whole cardigan is a quick sew – it took longer with the swearing (a frequent part of my sewing projects), the sweatshirt deconstruction and fudging the pattern layout. After doing a test run with the Toaster #1 from Sew House 7 (using an oversized golf shirt to make a top), I was ready to cut into a lovely black and white knit from Cali Fabrics. It was an easy pattern to use and to sew, and I was done in a few hours. 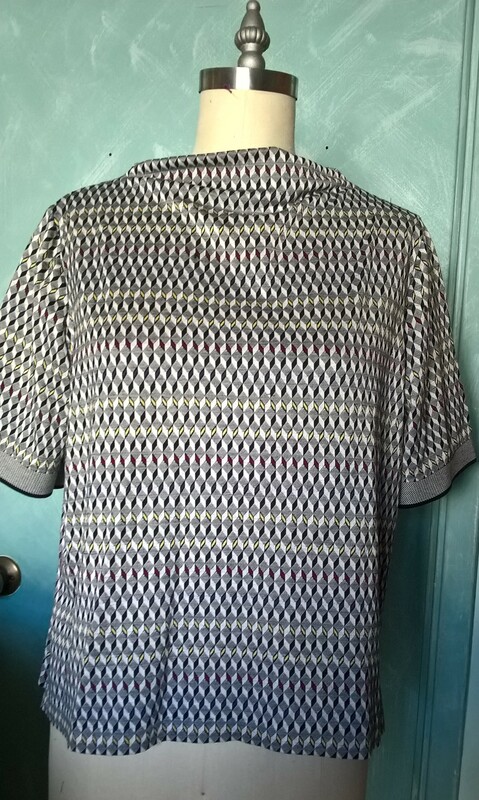 It’s a comfortable top to wear and could be sewn in a lot of different knits. I’m keen to sew Toaster Sweater #1 (included in the pattern) as it may be a little more flattering on my body, which seems to be lacking any shapeliness it once had (chocolate, wine, burritos, perhaps)……….but I think I’ll get a lot of use out of this one – it’s a more interesting choice than a plain old sweatshirt. And, in case you were wondering what accompanied me….Will Varley, Postcards from Ursa Minor. I joined the Project Sew My Style sew along organized by Alex at Bluebird Fabrics. Each month, we will all sew the same pattern, and post pics on social media. The first pattern is the Toaster Sweater #2 from Sew House Seven. I bought a black and white knit fabric from Califabrics for this, but wanted to make a quick toile to check the fit. So, I picked up a very large man’s shirt at Goodwill ($3). I knew I wouldn’t be able to get long sleeves out of this shirt, but figured it would give me an idea of the body size anyway. First issue was the button front. I couldn’t cut around it, so switched it around to be on the back and just left one button on. I was able to cut the back and front from the shirt pieces and made the sleeves as long as I could using the existing sleeve pieces. The pattern is a pretty quick make. I think it’s going to be more flattering in my softer black and white fabric, and with the long sleeves, but I’ll wear this top – for an investment of $3, and a couple of hours, it will be a useful T-shirt alternative. It all started when I visited a local eco fair and saw some cool shirts for sale on a soft toy booth (Indy Plush). Basic T-shirt shapes are not flattering on me, but I loved the unique prints, so I snapped one up in the largest size they had – I knew I would end up refashioning it in some way, so wanted as much fabric as possible. The weather finally started to cool down a bit, and I realized I don’t really have any long sleeved T-shirts (I’m rarely cold enough for sweaters). I dug out the T-shirt, popped on some inspiring music (The Fratellis), and pondered. After a bit more rifling through the refashioning bags, I found a $3 thrifted bargain – a huge, soft man’s shirt, new, with tags. I chopped off the sleeves off both shirts, and trimmed the grey ones to flatten the sleevehead more like the ones from the blue T. I overlocked them on, and did a topstitch around the seam. 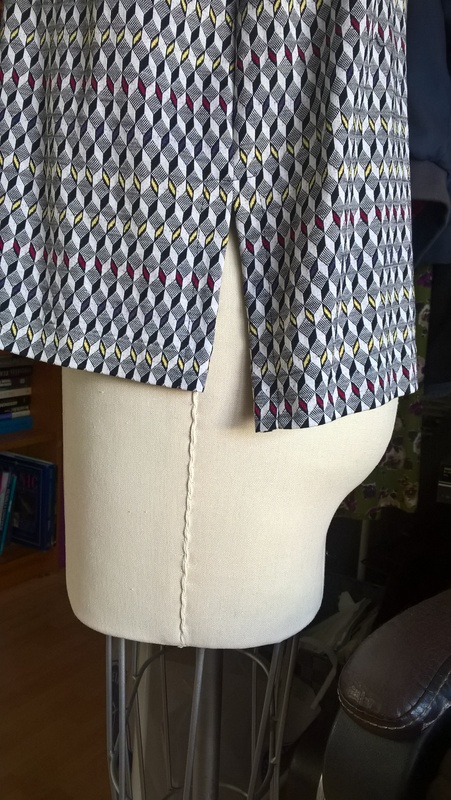 Then I cut away the neck, and used the hem of the man’s shirt to make a contrast edge, again overlocking on and topstitching. It’s still a sloppy shape, but will be a cosy winter top that I can throw on with jeans! My last skirt for therefashioners2016 challenge at Portia Lawrie’s site , was one of those ideas that kept morphing into something else, mainly due to the amount of fabric yielded by the jeans. From the beginning, I had wanted to create a plaid or check using strips of different shades of denim. So, throwing any idea of pattern cutting by the wayside, I got out a pair of my trusty old shears, and began to snip and rip. I have to say, I find a weird satisfaction in the sound of fabric ripping (probably drove my husband nuts while he was trying to hear the TV). After snipping and ripping two pairs of thrifted jeans (a global project – 1 bought in Wales, 1 in California), I realized I wasn’t going to be able to create a piece of fabric to fit around my hips with all the seam allowances taken into account. I rifled through my refashioning heap, and found a skinny pair (unfortunately), then took a peak in my son’s thrift store donation bag – bingo, 1 more pair! By now, my husband had given up on TV, and I needed something to give me a kick up the bum to get going with this project…..Gogol Bordello (Pura Vida Conspiracy) – that did the trick! I stitched a panel of stripes, and liked it, but I was still sold on plaid. So, I made another panel adding the horizontal strips – it wasn’t exactly what I wanted….hmmm, time for some thinking nutrition (strong coffee and a mini Bounty)….it morphed into a wavy plaid. Despite the extra jeans, these 2 panels wouldn’t be big enough, so I used leftover leg pieces to make side panels – cutting and pinning till they fitted. The top edge was finished off with a scrap of the lightest weight jeans, and I added metal buttons (from my stash) on the side, and one pocket on the back. Nearly done, except it’s a little too short for me. I did the last few rips, and managed to get 4 panels to use as a hem border, fraying out the bottom.